Massive work by Lee Dorsey, recorded years after his classics in the 60s, and even funkier overall! Lee’s really cooking on all burners here, working with the production team of Allen Toussaint and Marshall Sehorn, and getting some incredible backing from The Meters – who are at the height of their powers during this period! In a way, the set’s one of the ultimate New Orleans sessions of the 70s – a culmination of all the best elements that were percolating together in the 60s indie underground, simmered together perfectly in a tighter 70s Polygram funk mode! Includes the massive original version of “Yes We Can” way better than any of the subsequent cover versions. The Meters bring the funk, Allen Toussaint brings the songs and the production and Dorsey brings the charisma and warmth, broad in appeal even when the messages are angry and defiant like ‘who’s gonna help brother’ and ‘yes we can’. Just quality new orleans soul. Arranger and producer Allen Toussaint knows that funk can be subtle and still hit hard. With The Meters as the backing band, you know you’re getting excellent musicianship. 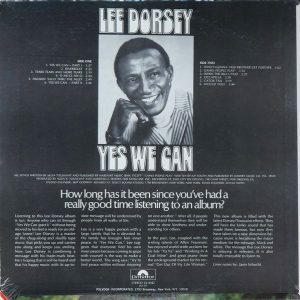 And to top it all off, Lee Dorsey possesses one of the most soulful yet commonman deliveries in all of rhythm & blues. What more could you want? How much more could you even handle? Yes We Can is 12 songs of pure New Orleans splendor, each track a Toussaint original. It’s flat out thrilling to hear the horns laze ‘n slide in on the title track and then punch it up right when your defenses are down. The smoky blues percussion of “Riverboat” can be accused of giving the listener whiplash. The voodoo grind of “Occapella” can shake the nastiest curse. The bassline of “Who’s Gonna Help Brother Get Further?” is a powerful statement all on its own. And then you add Toussaint’s wicked songwriting talents and Lee’s humble but purposeful delivery on top of it all and, before you know it, you’re addicted. And with all due respect (and then some, and then some more, and then even a wee bit more on top of it all) to Allen Toussaint and The Meters for providing the oomph and the groove and the howl and the chill of Yes We Can, the real aspect that pushes the album over the top for me is the personality of Lee Dorsey. He pulls off the call-and-response of “Would You?” with genuine quiet class. He pumps through “Tears, Tears and More Tears” with unmatchable urgency and shamelessness. His smooth delivery in “O Me-O My-O” makes me want to break it down somehow or someway, whatever that entails. And when he finally cuts in on Part II of the title track, I get goosebumps. 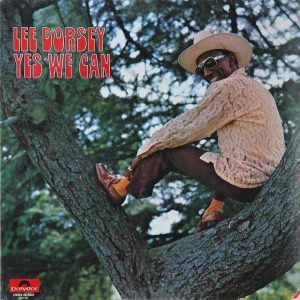 There’s a magic to Lee Dorsey’s presence on every record, and when you throw Allen Toussaint and The Meters into the mix, it’s unbeatable. This is real funk. Pure New Orleans soul. Truly amazing – thanks for this flavour of new orleans soul! A great discovery for me. Outstanding i miss this kind of music. Thank you very much for sharing so much great music with us !!! I love your blog !!! Absolutely sublime,listening﻿ to this is a wonderful experience. Thanks Nikos for this brilliant share. insane! thank you so much! Perfect. Have a nice weekend. Thank you for sharing the hot stuff. If you are truly a fan of 60’s and 70’s soul, this album is a must have. I have been dying to get an original vinyl copy of this for years!!! I absolutely love this! Listen to it often! This is a really solid joint. thanks for the share. 1000 mercis. Ce joyau retrouve ici son éclat.